We are ever grateful for the prayers of the saints. Murray and Tsuruko now have internet and phone service, no water yet. We were able to deliver cell phones for the Cummings and Uomotos in Sendai via Luke's friend who is taking supplies there. We just spoke with the Cummings for the first time now on the phone. They finally have electricity and water, though no internet. Heating is normally room heaters using kerosene and that must be conserved because of the shortage of supply. Gas is rationed. Cummings are not heating their home due to the shortage though it is snowing outside. Aftershocks continue to come and their sleep is often interrupted. Basically no food in the stores in the northeast region where the large quake. Edie and Cal have been sharing what they have with neighbors, and she is currently baking bread to give away. 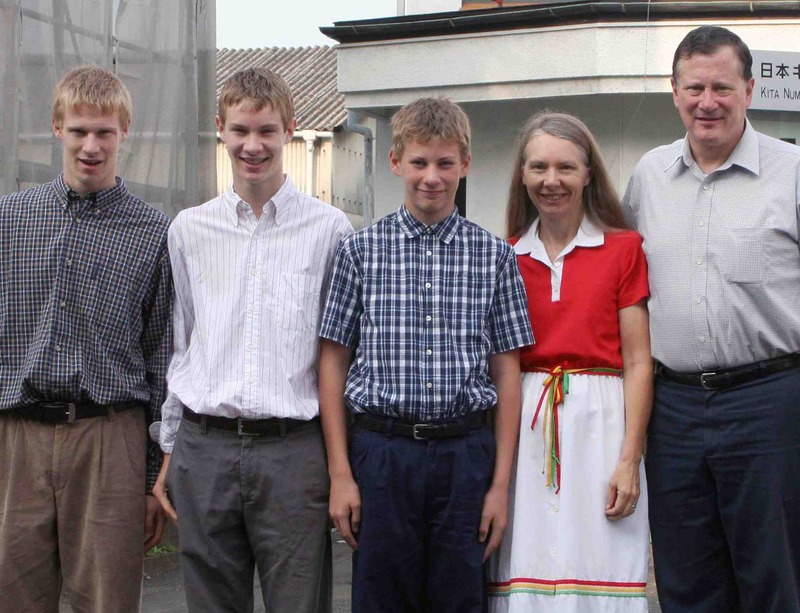 Pray for the Uomotos, Cummings, and the churches there as they share the gospel with their neighbors. Sorry to be so brief, but we are trying to make other preparations to help them. We also need to visit elderly in our area since some basic food is scarce here as well. Thankfully, the quake which hit here last night did no severe damage though it was a 6.4 magnitude. Please pray for the spread of the gospel as the aid is distributed. Thanks be to God for his many mercies! Thank you for your prayers. Yesterday, we searched for gas tanks to take up north and they were all sold out. We also visited a few homes and had the opportunity to read the Scripture and pray with those who need to know the Lord and reassure them that God promises to care for those who belong to him. One unbeliever who has attended church on occasion asked me, "Why not return to the U.S. where you will be safe?" It was good to be able to say that we need to stay because the people of Japan need to know God and to hear the promise of the gospel. Today, we are trying to arrange for Woody and me with some kids to take a truck and possibly a carload of supplies to Sendai. Reports are horrific. A mayor in one city in Fukushima said that the situation there is dire. Hospitals are running out of medicines, food, and water. No government aid is being offered there. One home for the elderly in that city said they have 2 days of food and water left and no transportation available to evacuate the patients. They are only giving people a little food as it is. This is probably not an isolated case. The central government is overloaded. Food is running out everywhere up north. Even down here rice, bread, and other supplies are disappearing (although we are in no sense worried for ourselves) from store shelves. Temperatures in Tohoku are freezing; little or no heat. Pastor Shiratsu reports that he and his wife receive 1 rice ball a day at the shelter where they are. It is hard to understand in this land of abundance why it is that food and supplies are not pouring in from all over the country. We have been trying to help a rescue team get into Japan for 4 days and no avenue thus far has panned out. Pray that God will work miraculously through churches, etc. to bring aide and the gospel. Please pray we can make the arrangements quickly: rental of the truck plus obtaining supplies. Please pray also that the nuclear plant problem will not become worse. In the morning we held our usual ladies' meeting . Before and after we worked at arranging for trucks and pursued a rumor that there were lots of supplies at a U.S. base in the Tokyo area available to take to Sendai. By late afternoon one of our members, Mr. Iida (baptized a couple of years ago) offered to drive his own 2 ton truck and secured another, borrowed from his friend. I will probably be the driver. David (my oldest) and Noriko (his wife) offered to drive two more rental trucks that we managed to find down in Hamamatsu, on the far side of Shizuoka prefecture—toward Nagoya. After David, Noriko and Laurie pick them up, 5 drivers with 4 trucks, along with my #4 son, Jonathan, will drive to Costco in Yokohama to begin 'filling up', then head into Tokyo to a homeless shelter to complete our food acquisition. 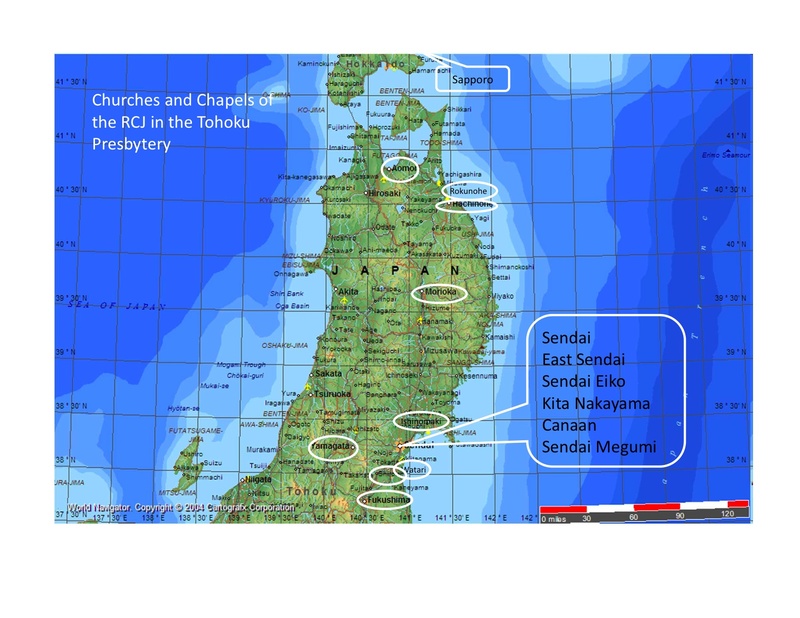 Then we travel north to the Sendai area to unload at Megumi and Watari Churches, and probably at one or two others as well. We had hoped that rumors the US bases could provide large amounts of food and other supplies for those going north would be true. Despite great cooperation from our stateside chaplains, it turned out what was available had been children's clothing only, and because the evacuation of non-military persons from the base, that, too, was no longer available. In the evening we filled plastic jugs with gasoline (in very short supply in Sendai) and I secured permits from the Police for the first two trucks to ride on the (otherwise closed) expressway leading north to Tohoku and Sendai. Also during the course of the day several members and seekers brought over very significant contributions to our relief supplies. We will also take 250 New Testaments and about 1,000 Ayako Miura tracts for those distributing food to give out with it. May the Lord Jesus be glorified in our words and deeds. We also received a report from the Diaconal Action Committee of the Reformed Church in Japan (RCJ) updating us on the various RCJ churches and chapels (for which information is available), and a letter from the pastor of Sendai Reformed Church (who is also, in God's providence, currently the moderator of the General Assembly of the RCJ). 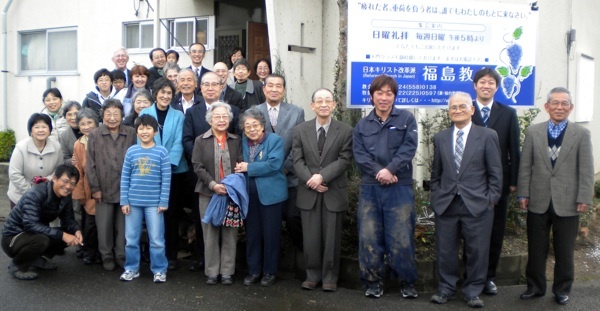 Finally, since Fukushima is presently so much in the news, we thought you might like to see some of our Fukushima brothers and sisters in Christ who gathered on November 23, 2010, to thank the Lord for fifty years of his grace to the Fukushima Chapel. Please continue to remember all these dear ones in your prayers.